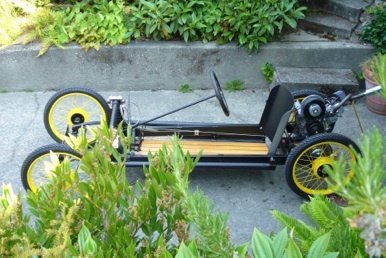 The “classic formula” suggests a plywood “monocoque” with rectangular steel rails attached to the sides and shaped foam over the plywood box which is then fiberglassed to create the bodywork. Most of our cars have have welded steel ladder frames. 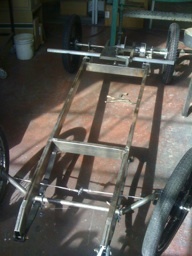 Most of those have plywood floor pans attached to the frame to stiffen it. The Panhard, Fiat, Miller and Austro-Daimler are done like this. This conventional approach is true in spirit to the inspiration period. Panhard: Flat ladder frame. Rails are 1” x 3” 0.065” wall steel tube. 17” apart at the front and 21” apart at the rear. Fir tongue a groove planks glued together and planed down to 3/8” as the floor pan. Fiat: 1” x 3” x 0.083” wall steel frame rails. 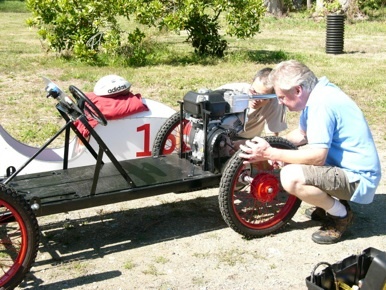 Frame is underslung at the rear axle (frame is not flat). Four cross members plus round cross ties at the front and rear. Parallel rails are 16” apart. 1/2” mahogany plywood floor pan. 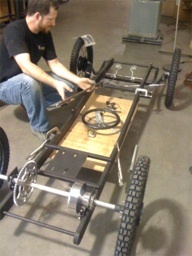 Miller: 1” x 2” x 0.095” wall steel frame rails with 1/4” steel angle extensions to the axle carriers at the rear. Various size cross members. Rails are 17” apart. Floor pan is 3/4” plywood. Austro-Daimler: 1” x 3” x 0.083” wall steel tube rails in a more pronounced “vee” than the Panhard. Rails are 13” apart at front and 22” at rear. Two cross members in same material with an additional 1” x 1” cross member at the front axle line. 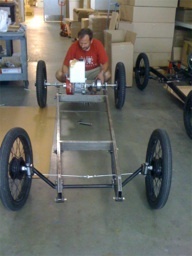 Engine sub-frame is mostly 1”x1” x 0.083” wall with a 1/4” steel motor mounting plate. The GN also has a ladder chassis but no floor pan. The floor is 1/4” x 2” oak strips on three 1/8” x 1 1/2” bent aluminum flat bar straps. There is a cosmetic 1/32” plastic skin under that. 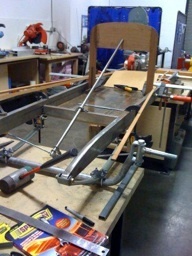 The frame rails are 1” x 3” x 0.065” wall steel with three cross members in the same material. The side rails have been drilled with “lightening holes” using a hole saw. The rails are 15 1/2” apart at the front and 16 1/2” apart at the rear. This frame is very light but flexes like a 13 year old gymnast! 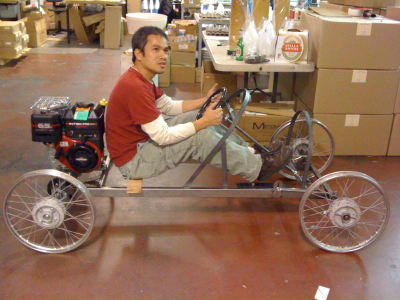 The Peugeot frame is very different. The Frame rails are 2” x 3” x 1/8” wall 6063 aluminum with three 1 3/4” diameter x 1/8” wall 6061 aluminum cross tubes. 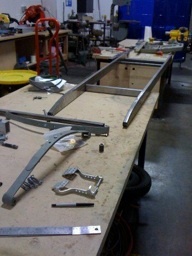 Side rails are drilled such that cross rails are welded at the inside and the outside of the rails. There is an additional 1” diameter cross behind the engine. This very stiff welded assembly is further stiffened with a stressed dibond floor pan (thin aluminum skins sandwiching a plastic core). The seat back is also dibond and is integral to the frame. This chassis is absolutely rigid. The builder was lucky to have the scrap aluminum and dibond - it would have been expensive. A “professional” welder was enlisted for beer to weld the aluminum. Side rails are 13 7/8” apart. This car seats two small people. This is the only one of our cars where the seating position is above the side rails. Bloody Mary’s “frame” is absolutely unrelated to the frames described above. It really should be called a tub. The side rails are hollow, glued up from 1/2” birch plywood strips. 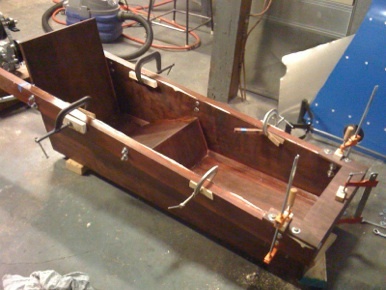 The tub itself is glued up out of 1/4” softwood plywood. The seat box is baffled and 1/4” to 1/4” junctions are backed reinforced with triangular softwood strips. There is a 1” x 1 1/2” x 0.065” wall welded steel hanger attached to the rails at the back which supports a 1/2” softwood ply shelf for the engine (vibration dampening again). 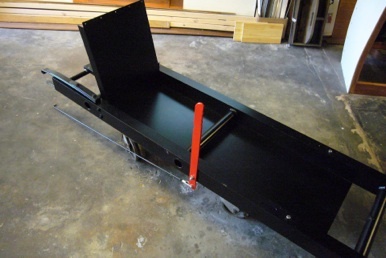 The front of this shelf is attached to the tub with a flap hinge (pulling the pin drops the motor for service). There is a piece of oak glued inside the seat back where the hinge is through bolted. This tub is phenomenally light, extremely stiff and almost all table saw work. It is mostly glued together with weatherproof wood glue. 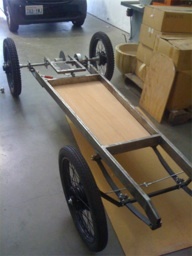 Urethane glue was used where the side rails are joined to the sides of the tub. Inside width of the tub is 15 3/4”.